A pretty good read if you like cats and ever rescued one yourself. Years ago, when I still lived in Atlanta, I was a regular at the Farmers’ Market where I bought most of my groceries and took advantage of the recycling center adjacent to the market. One Saturday morning, as I was being a responsible citizen and recycling my cans, glass, cardboard, plastics, and printer paper, a scrawny black kitten wandered out of the underbrush on the far side of the parking lot and made her way to me. Now mind you, there were easily two dozen other people she could have chosen, but it was my feet she flopped down on. I picked her up to get a better look at her. Her eyes were a gummy mess. Her fur was muddy and matted. Every bone poked out every which way. Her abdomen was sunken in and she was too weak to even mew. I didn’t take her to the clinic near Emory. I brought her home with me. I confess, I tried for days to find someone —- anyone —- who would take her and make her their own, but no dice. I already had two cats, and what sane person would ever have as many as THREE??? Surely I couldn’t keep this kitten. But the Divine Universe had spoken. This little ragamuffin had elected me to be her person. Who was I to argue with destiny? So Jackie Mew-vee-ay (I was a big fan of Jackie Bouvier Kennedy Onassis) joined Butch and Bruce, and mine became a three cat household. Little by little, the waif put on some weight. Her bones protruded less and her lackluster coat took on a healthy shine. In a few months, she morphed from a scraggly, homeless urchin into a sleek, gorgeous goddess who ruled the house. Butch and Bruce were still youngsters — wild guys who played with total abandon. Jack, on the other hand, had no interest whatsoever in any cat toy of any sort. It was as if all of her energy in her early months had gone to staying alive on the mean streets and the idea of exerting yourself just for fun was a completely alien notion. One day after Jack had been with me a while, I’d been out working in the yard, and I forgot to take off my garden gloves before going into the house to get some lunch. I dropped the dirty gloves near the back door where I could grab them on my way back out after I’d eaten. A few minutes later, I heard the unmistakable sounds of a cat trumpeting —- the sound they make when they’ve made a kill. And there came Jack, parading through the house carrying one of my gloves. She was so proud. She marched around as though she’d slain the biggest, baddest mouse in the history of the world. Then like every cat who wants to prove to her person how very useful she is, she laid her trophy (the glove) at my feet and trumpeted once more just for good measure. I praised that girl for all I was worth. I told her she was my heroine and that I knew I’d be safe from evil garden gloves for all time and eternity. In typical cat fashion, she ignored me, flicked her tail, and went on her way. Thus began Jack’s love affair with garden gloves. Since it was the only thing that came close to passing as a toy or recreation for her, I took to leaving gloves around the house. She didn’t like clean ones, only those that had been used. 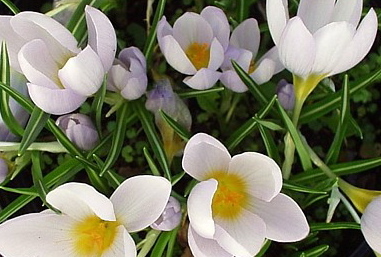 Maybe it was the smell of the earth on them. Maybe she liked that they had the scent of my perspiration on them. Who knows what goes on in a cat’s head? Circumstances changed, and in August of 2001, I left Decatur to move to the mountains. Butch, Bruce, and Jack came, too. Cleo joined the family in early 2002, just a short time before Butch’s kidneys failed him at the tender age of five-and-a-half. That loss cracked open the gate, and I found myself drawn to giving cats that were out of options a place to call home. As the cat population grew (and grew), through it all, Bruce and Jack were my constants —- my “original” kids. Bruce was granted 15 years. He left me in late March of 2011. Only Jack, my slayer of the deadly garden glove, remained from my original trio. Night before last, around 10:00, Jack had a serious stroke that left her partially paralyzed. I called the nearest emergency vet facility and described what was happening. The vet assured me that if Jack wasn’t crying out in pain, laboring to breathe, or having repeated seizures/convulsions, if I wished to, I could keep her comfortable at home until my regular vet’s office opened in the morning. My other choice was to bring her in and have her euthanized. Jack and I talked it over and she made it clear she wanted to stay at home. My first female feline, my first rescue from the streets and I spent one final night together side by side. We remembered all the good times and tried very hard not to think about the fact that the time had come for goodbye. The next morning, Dr. Worthy gave Jack a tiny assist and my darling Jack was gone. As is my custom, I put Jack in a burial box with spices and flowers and wrote her name and the dates of her time with me on the box. I picked a spot right next to Butch and Bruce’s graves for Jack’s resting place. I dug the grave, laid her burial box in the hole, and tossed in the first shovelful of dirt. As I did so, I noticed the garden gloves I was wearing. I laid the shovel aside, brushed the dirt off the box, and pulled it back out. I opened the lid, stripped off my gloves, kissed Jack’s head one more time, and tucked my gloves in beside her. I simply couldn’t run the risk that kitty heaven wouldn’t have the only thing that ever made my Jack Cat play. When my time comes to join Jack (and all the other fur kids I’m counting on being there to greet me), I’ll be listening for the unmistakable sound of my Jack announcing she’s once again triumphed over the sinister garden glove. Until then, my beloved Jack, happy hunting. Happy hunting. 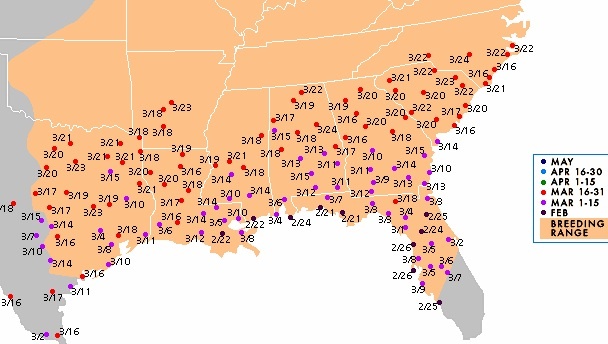 Their migration is underway! Lucky little fliers spend their winters in the Caribbean, Central America, and the Southern-most parts of Texas and California. They’re heading as far north as Alaska and Canada, seeking mates and natural nest cavities or birdhouses to raise their young. Competition for nest sites is brutal… real estate’s tough out there! Dwindling and disappearing habitat being a major cause, with fewer snags (dead trees) left intact. 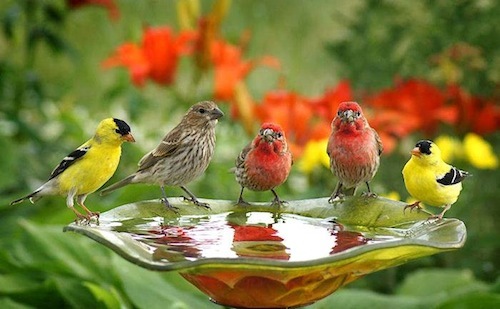 Non-native birds are also seeking the same nest spots and put up one fierce fight for the right to claim territory. European starlings and house sparrows wreak havoc on tree swallows, purple martins and bluebirds alike. Just ask any landlord, most will have sad tale or two to tell. Many people who offer martin houses or blue bird houses will discourage these aggressive species in order to protect native songbirds. 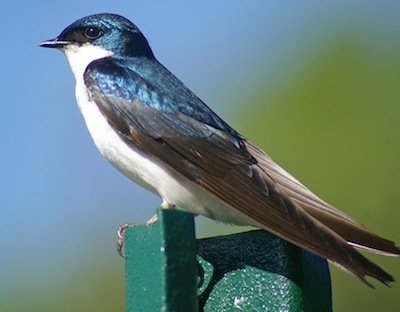 A favorite house among our “blues” here in the southeast is the Gilbertson Nest Box, and tree swallows will commonly use them as well. 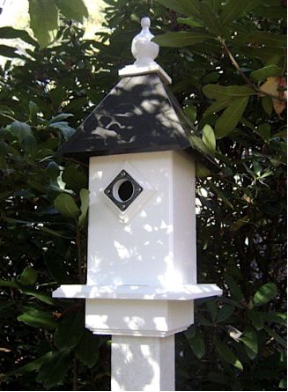 A sturdy vinyl nest box with wood roof, it’s easy to monitor and reasonably priced. 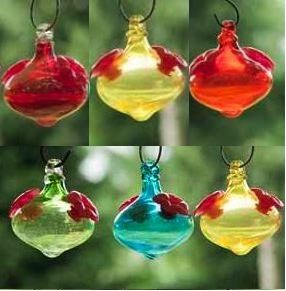 You can get one for the bluebirds and one for tree swallows! Just don’t place them too close together. For best results, one in the front and one in the back is a pretty good rule of thumb. 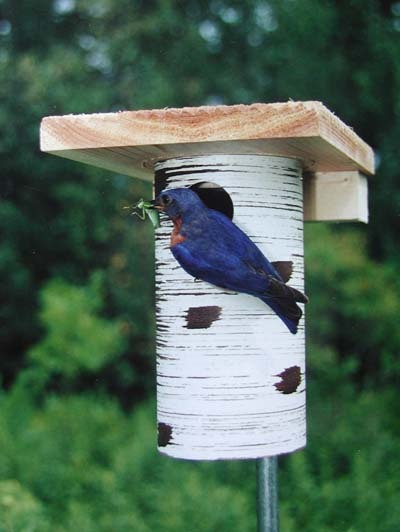 Because all blue bird houses are not created equal, we highly encourage anyone serious about helping bluebirds to use houses approved by The North American Bluebird Society. When you see the acronym NABS… you’ll know! 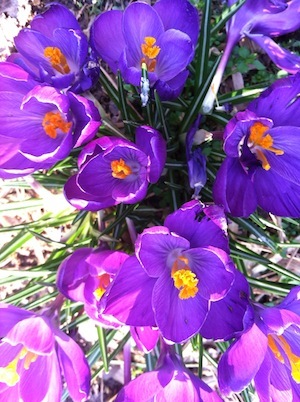 Celebrate spring and help welcome all migratory friends from their long journeys North! 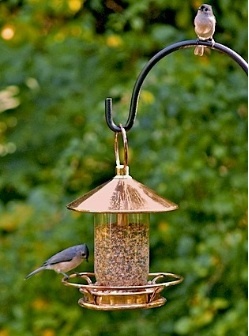 Nab 10% off site-wide on all bird houses, seed feeders, birdbaths and hummingbird feeders too. 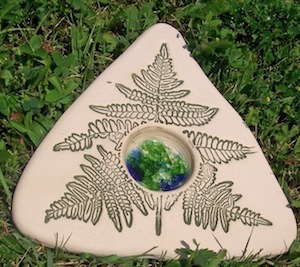 And don’t forget the nesting material… we’re giving that away free with all orders through May 15th! 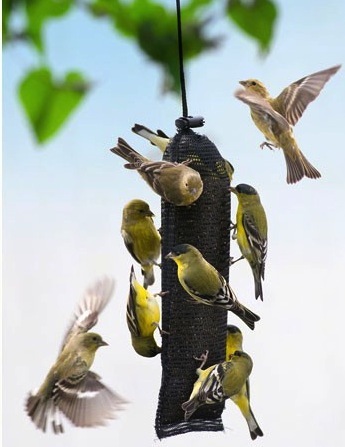 When you’ve finally had enough of squirrel’s shenanigans, you know, chasing off songbirds, stealing all the food, and those constant acrobatics including hanging upside down from your bird feeder… it might be a good time for a one-time investment in squirrel proof bird feeders. Look at this guy acting as if he owns it! 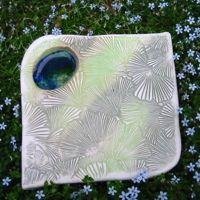 Even if just one quality model that really works, absolutely lasts and has a lifetime warranty. 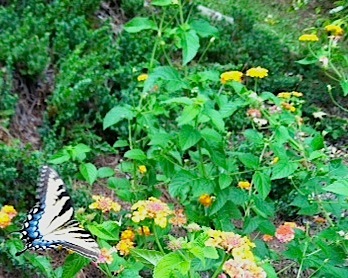 For peace of mind and just to outwit the little critters once and for all, it’s so worth it. 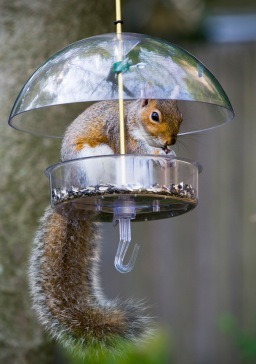 Although this feeder has a dome or weather guard, it sure isn’t squirrel-proof. 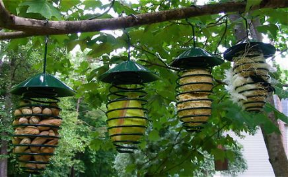 On the other hand, Squirrel Busters are, and they too now have an optional weather guard to keep seed dry and offer shelter while feeding. 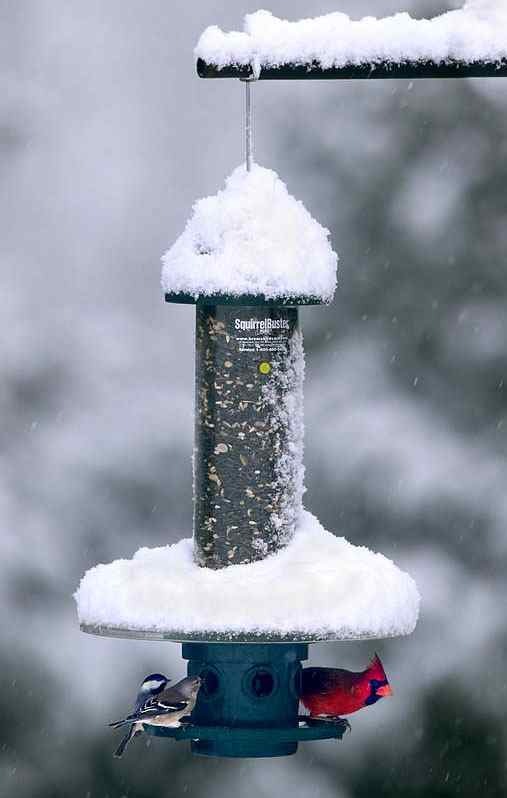 Considering the amount of snow most of the country has seen this winter (and some still seeing it) the weatherguard could actually mean the difference between a meal and starvation for some feathered friends. 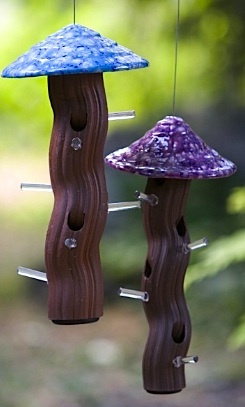 So how do these squirrel proof bird feeders work? First, there’s no batteries or power source to mess with, that’s convenient. 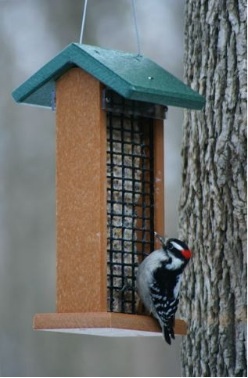 An adjustable weight mechanism closes off seed access to squirrels, and bigger bully-birds too. Some other cage-type feeders may operate on this same principle, but they’re not as well made and don’t carry that lifetime warranty either. 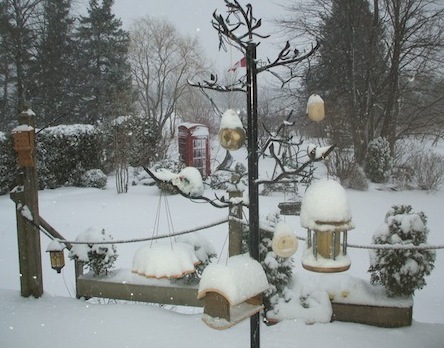 Like the Postal Service motto: Through rain, sleet and snow… your birds can eat! Check out the video below, the squirrel action doesn’t start until about midway through, but there’s some cool close-up filming of cardinals, woodpeckers, goldfinches, titmice and other friendly fliers visiting for a bite to eat.